KARL RANDALL, aged 50 is on track to complete his 300th marathon at Bournemouth next month. Once completed, Karl will join the World Mega Marathon Rankings list, with only around 500 other people worldwide who have achieved this number of marathons. After realising his weight had crept up to 18 stone in 2008, Karl became determined to change his ways and joined a gym. Nine years later and now a fitness fanatic, Karl is gearing up to enter the elite 300 marathon club when he reaches the marathon milestone in Bournemouth on Sunday 8th October. 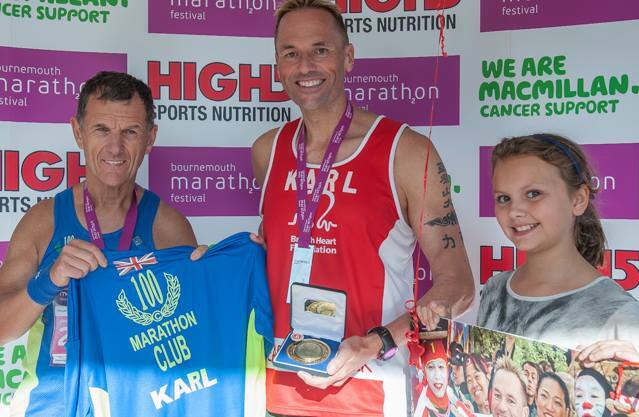 “Following the Bournemouth Marathon in October 2013, I continued to run on average 50 marathons a year and now find myself on 291 marathon completed with Bournemouth confirmed to be my 300th.” said Karl. The journey to number 300 hasn’t been easy, as Karl recently spent 12 days in hospital undergoing an emergency operation just three months out from marathon number 300. If you’d like to join Karl on the start line, there’s still time. Late entries for the half marathon, 10k, 5k, and kids’ kilometre are open until Wednesday 4th October at 5pm and charity entries are still available for the full marathon. Sign up online at bournemouthmarathon.com. PUPILS from St Marks Primary School in Swanage were celebrating this week as they found out their medal design was chosen as the winner of a Bournemouth Marathon Festival competition. Local school children in the local area were asked to get their creative juices flowing and come up with some designs for the Bournemouth Marathon Festival junior race medals, for the event taking place this October 7th. The organisers managed to single out 3 designs, which were them uploaded to their Facebook page and the public were then asked to ‘like’ the design which they deemed best. St Marks Teaching Assistant & Running Coach, Paula Lawton-Archer, said: “We are delighted that our design won and will be transformed into a medal for this year’s event! The children were so pleased when they found out they had won. There are a group of us taking part this year and we can’t wait to wear the medals with pride!” There are 4 junior races on offer as part of a packed weekend of running which also includes the Supernova 5k, Supersonic 10k, Half Marathon and Marathon. Over 500 kids took part in last October’s event, which was the biggest yet. The winning team from St Marks Primary School will see their design transformed into a medal to be used across all of the junior races. They have also been awarded 10 free places to the event for the school children to use. 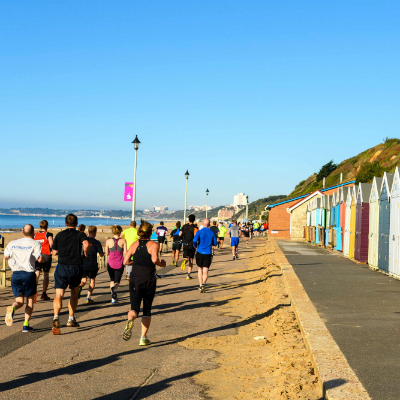 “The Bournemouth Marathon Festival is now into its fifth year and is already established as one of the UK’s top autumn running festivals. It’s great to see children getting fully involved in the junior races. Better still when they get to watch mum and dad taking part in the other events. It really is a fantastic weekend for all the family.” Annette added. The junior races kick-start the weekend on Saturday 7th October and are a great way for children to be active, have fun and get involved over the weekend. Each finisher receives a medal, wicking technical finishers t-shirt, race recovery pack, chip timed result and a fantastic running experience. 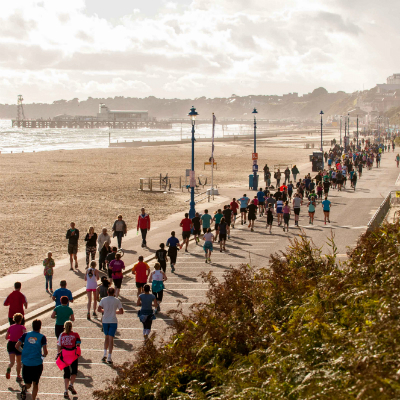 A record breaking 13,000 runners signed up to run in the fourth edition of the Bournemouth Marathon Festival on 1st and 2nd of October. Runners from across the UK and beyond gathered on the Dorset coastline for the biggest event yet. The festival included the Marathon, Half Marathon 10k, 5k, and Junior races which made for an action-packed weekend. As dusk fell in Bournemouth, it was time for the glow in the dark Supernova 5K runners to light up the night. The final Saturday race kicked off at 7pm; runners set off along the promenade clad with fluorescent gear and each with a headtorch, creating a breathtaking visual spectacle. The eventual winner was Bayley Massey from Cambridge Harriers, in a time of 17 minutes 7 seconds. Bayley commented: “It was fantastic, the fact it’s a night time run gives it something different, it was great seeing everyone coming round behind me as I made the turn. This is my third time down here in Bournemouth and I love it every year.” Bayley was followed home by Michael Johnson of Wimborne AC, and Cameron Telford of Poole AC, in second and third. The two junior races got the ball rolling at Saturday lunchtime, with hundreds of enthusiastic young runners crossing the finish line in the bright Bournemouth sunshine. The 1.5K for ages 6-8 was first up at 1:30pm. Eight year old Jon Pepin from the New Forest Juniors club raced to a new course record of five minutes and 20 seconds, while the first female home was eight year old Ruby Moroney, in a time of seven minutes and one second. An hour later, it was the turn of the 9-12 year olds in the 2K. Finn Pardy (aged 11) of Poole AC was first across the line in seven minutes exactly, and Southampton AC’s Megan Hulbert (aged 11) was first female home in seven minutes and 49 seconds. The female race was won by Eddah Jepkosgei of Kenya, who held off a strong challenge from compatriot Hildah Cheboi. Jepkosgei said: “I liked the route. I was with a group until about 7km and then I went on my own. 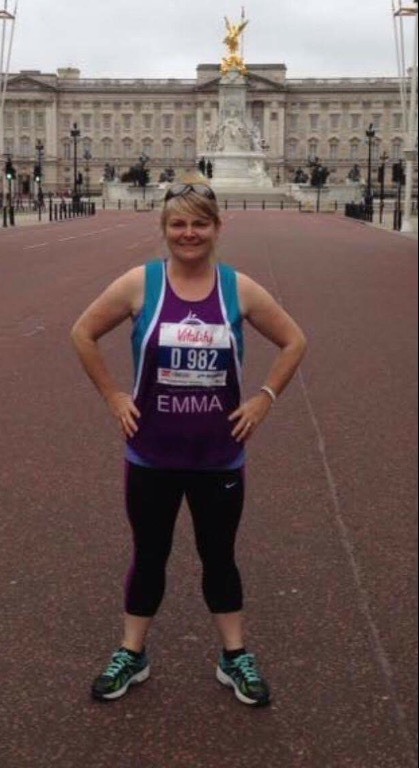 I enjoyed the day and the sunshine was lovely.” Brit Emma Prideaux of Billericay Striders came home in third place finishing in three hours one minute and 15 seconds. Ben Smith, who was the official starter of the full marathon, sounded the start of the race at 10am which saw thousands of runners set off from Kings Park and complete the coastal marathon route around Bournemouth and Poole. Ben completed his 398th marathon on Sunday, which is part of his 401 challenge – to run 401 marathons in as many days and raise money for Kidscape and Stonewall. 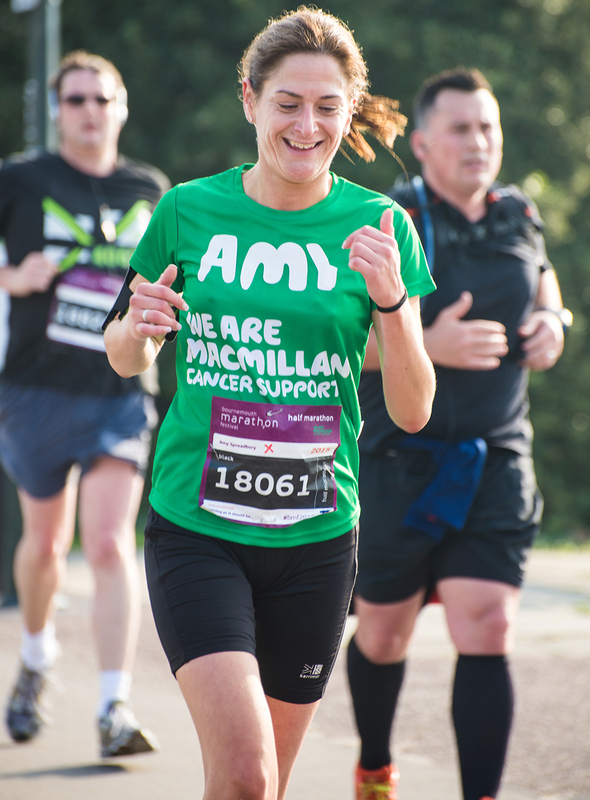 He said: “It was an absolute honour to be the official starter of the Bournemouth Marathon. I actually ran a PB for the challenge – 3:39:22. This is the third year I’ve done this event and it gets better and better every year. Neil Kilgour, Race Director said: “It’s been another incredible record-breaking weekend at the Bournemouth Marathon Festival, with over half a million pounds raised for good causes. “Thanks to all the runners, supporters on route and to our fantastic team of volunteer race crew from all over the UK and beyond for making Bournemouth one of the UK’s ultimate running destinations: running as it should be. 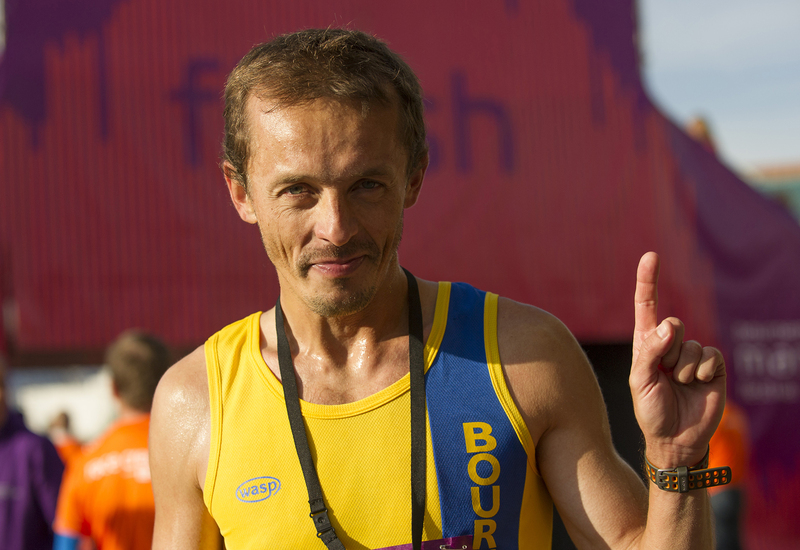 401 MARATHON RUNNER Ben Smith (34) will be the official race starter of the 2016 Bournemouth Marathon on Sunday 2nd October. Ben is close to the end of his remarkable challenge of running the equivalent of 401 marathons in as many days. The Bournemouth Marathon will be Ben’s 398th marathon. The race starts at 10am on Sunday morning which will see thousands of runners set off from Kings Park and complete the coastal marathon route around Bournemouth and Poole. Ben has currently raised over £165,000 for his two chosen Anti-Bullying charities Kidscape and Stonewall. Part of the 401 challenge is to raise awareness of the shocking effects bullying can have on an individual after Ben experienced bullying at boarding school which led to two suicide attempts and depression. Since the challenge began, Ben has visited nearly 100 schools where he has delivered educational talks about the harmful effects of bullying. “The Bournemouth Marathon is the only official marathon that I’m doing twice throughout my challenge so I’m incredibly honoured to be the official starter for the Bournemouth Marathon.” said Ben. Abi Beautyman, Bournemouth Marathon Festival Elite Coordinator, predicts another “very quick series of road races on the fast Bournemouth route” as Ukranian Igor Olefirenko and Kenyan Peninah Wanjiru Ndungu both look set to light up the Bournemouth Marathon when it takes place next Sunday 2nd October. Olefirenko will be taking part in the Bournemouth Marathon for the first ever time after setting a lightning quick 2:13:33 time in Japan earlier on this year. With the current course record of 2:16:00 set by Boaz Kiprono in 2015, the Bournemouth Marathon could be in for a record breaking year. Olefirenko isn’t in for an easy ride however, with Kenyans Stanley Kiprotich Bett and Julius Kiplagat Korir both looking to put up a fight in the elite men’s race. Abdelhadi El Mouaziz from Morocco is also lining up after finishing the Edinburgh Marathon earlier on in the year in a time of 2:20:13. In the elite female race, Kenyan Ndungu starts as favourite after running 2:34:25 in Brighton last year. However she’ll face stiff competition from fellow Kenyan Eddah Jepkosgei who won the Edinburgh Marathon with a time of 2:39:53 back in May. Sophie Carter is back again to defend her British title which she won last year. Behind the elite athletes, there’s other athletes aiming for unique world records. Ben Smith of Bristol is in the midst of attempting to run 401 marathons in 401 days – Bournemouth will be Ben’s 398th marathon in 398 days and is the only marathon he is set to run twice. Four men are set to run the Bournemouth Marathon on October 2nd in a Viking Ship as part of their Knights4Charity charitable campaign. Paul, Dave, Neil and Patrick are a team of four close friends who work together and share a real passion for supporting wonderful causes through daft endurance based challenges. Over the years, they have set 38 indoor rowing world records and raised nearly £40,000 for a number of charities. 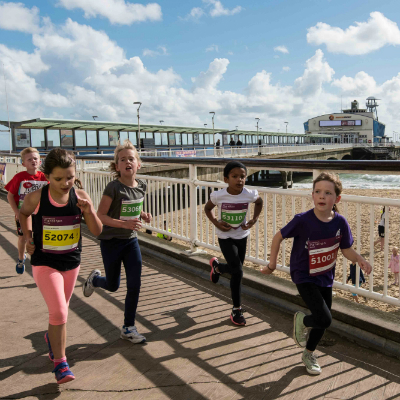 PUPILS from St.Katharine’s C.E Primary School were treated to a surprise visit from Double Olympian and Commonwealth medalist Liz Yelling last Wednesday where they were revealed as the winners of the Bournemouth Marathon Festival Junior Races competition. Liz surprised the winning school during their assembly for National School Sport Week (NSSW) where she presented a trophy and £150 worth of vouchers to be used towards school sport equipment. Young runners aged 6-8 took part in the 1.5k race and 9-12 year olds raced over 2k as part of a packed weekend of running last October which also includes the Supernova 5k, Supersonic 10k, Half Marathon and Marathon. Over 500 kids took part in last October’s event, which was the biggest yet. The winning team from St. Katherine’s C.E Primary School consisted of Imogen Gent, aged 9, Erin Wells, aged 9, and Ruby Moroney, aged 7. 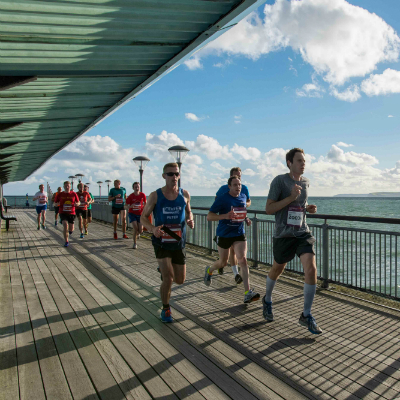 “The Bournemouth Marathon Festival is now into its fourth year and is already established as one of the UK’s top Autumn running festivals. It’s great to see children getting fully involved in the junior races. Better still when they get to watch mum and dad taking part in the other events. It really is a fantastic weekend for all the family.” Liz added. The junior races kick-start the weekend on Saturday 1st and are a great way for children to be active, have fun and get involved over the weekend. Each finisher receives a medal, wicking technical finishers t-shirt, race recovery pack, chip timed result and a fantastic running experience.